As the market waits for any headline materializing from the US/China trade talks, most Asian equity indices tread water. We did hear positive rhetoric from US Commerce Secretary Wilbur Ross that an agreement could be reached, but despite supporting market momentum more would be required. Tech and utilities have been leading much of the advances, which assisted the Hang Seng at the close (+0.15%). However, core Shanghai did not manage a positive trade all day and closed -0.26%. The Nikkei did see a positive day and even found the strength to rally into the close (+0.82%). Much of that move was initially offset by the Yen’s depreciation (printing with a 109 handle). However, by close of US trading, the Yen was back to unchanged following equity market uncertainty. The ASX saw a similar pattern, gaining throughout the day as financials helped performance as bond yields increased. The SENSEX flip-flopped with currency, but the selling looks to have returned to the INR with a loss of -0.5% today. The outlook for the Indian Rupee remains weak with expectations that last years highs expected to be retested. The Turkish Lira lost over 2% today after President Erdogan responded following US John Bolton comments on Syria. Turkey 10yr debt did trade out to 16.22% but settled in at 16.18% (+26bp). Core European indices closed positive despite the DAX dipped from its day's highs. A 1% return for the CAC and a +0.75% for the UK FTSE, whilst the DAX lagged at +0.5% following weaker than expected Industrial Output data. Much of this recent bounce has been tech led, but they were beaten quite badly recently and so look to be rebalancing. Given the return of UK Parliament yesterday, we are starting to see more headlines hitting the screen surrounding BREXIT. Pressure came yesterday for Theresa May after 200 PM’s requested she rule out leaving without a deal. GBP started to suffer in late US trade as US equities regained momentum and saw the USD bid. The vote due next week (Jan 15th) is still likely to fail, as it is widely rumored nothing has changed! In a late vote, the attempt by ministers to rule out a ‘No Deal BREXIT’ has been unsuccessful – GBP hit again. Although, that may be a little unjust as the Euro is also off -0.35% as US Dollars benefit on the equities bounce. ArmstrongEconomics.com offers a collection of research from Martin Armstrong, a world renown economist and the creator of the Economic Confidence Model, the author of the Greatest Bull Market in History, and founder of Princeton Economics. 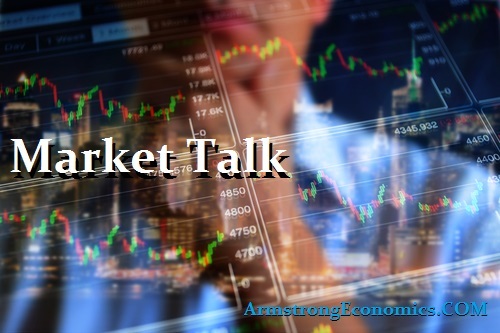 This web site is a resource to stay up to date on Martin Armstrong’s business accomplishments, legal battles, and views on the global economy. Editorial disclosure: Martin Armstrong was charged with fraud in 1999, but not convicted. Instead he was held in contempt of court and imprisoned for over seven years , one of the longest-running cases of civil contempt in American legal history. The government eventually dropped its charges in a plea deal with Armstrong for which he served an additional five years.